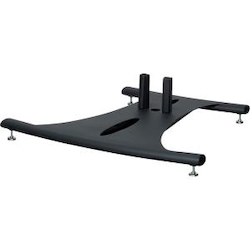 The EB-BASE is an Elliptical Floor Stand Base comes with leveling feet and the option to add casters. Flat panels can be mounted anywhere along the poles using the included PSD-HDCA Adapter, which attaches to the stand in less than a minute with the included tool. Weighing in at less than 50lb, the EB-BASE is easy to move as required for the application. Perfect for conference rooms, presentations, tradeshows and more.